Liquitex Basics acrylic paints are easy to use and developed for the beginner artist looking for dependable quality. 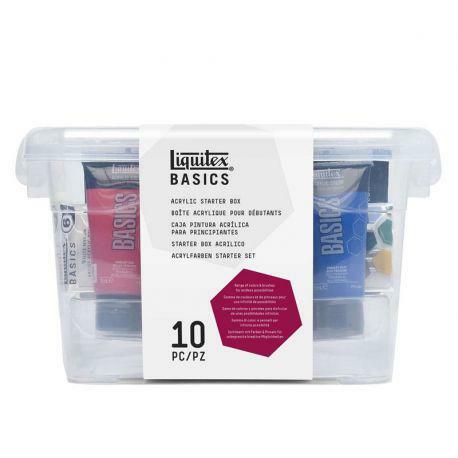 This convenient set contains 1 x 75 ml tube of primary red, primary blue, primary yellow, hookers green, burnt umber, yellow oxide, mars black, 2 x 75ml tubes of titanium white, a 6 pack of Basics brushes in sizes round 1 and 4, flat 2, fan 4, bright 3 and 6, and a Basics color chart- all packaged in a sturdy, reusable plastic storage box. Everything in box excellent and neatly arranged, contains colour chart. Makes a lovely present. Lid is easy to take on and off and also has a handle. This handle is a little tight to put your fingers through but not a big problem. Nylon brushes included. Love the variety of colours and brushes. By buying this product you can collect up to 17 loyalty points. Your cart will total 17 loyalty points that can be converted into a voucher of £0.17.